Gas mixing sounds simple enough. You simply mix a number of pure gasses to create a new mixture. Unfortunately, it’s not usually as simple as it sounds. There are many variables and factors that play a role. Scott Rouse | Sierra Instruments, Inc. In this post, we’ll dissect this challenging application and discuss how to obtain perfect gas mixing and blending with capillary thermal mass flow controller technology. There are many applications and industries that rely on gas mixing and blending. In a laboratory environment, our customers need gas mixtures to test catalysts to see the effect of certain concentrations of pollutants on gasses. The food industry needs a mixture of gasses to prevent oxidation of food. The semiconductor industry needs accurate gas mixing to generate certain atmospheres in their ovens. Hospitals mix gases to create O2 rich air or narcotic gasses. There are hundreds of other applications that utilize gas mixing like welding, dilution, chemical reactions, testing of gas analyzers, filling light bulbs, and double glazing windows. The most common gas blending applications, however, are related to burning and combustion. Do you remember the basics of combustion? You need fuel, oxygen, and ignition. If the fuel and the oxygen are both gasses, it is ideal to mix them in the perfect ratio to get optimum and clean combustion. We can name several applications for this type of gas mixing: Your car, big boilers, small flames used in the glass industry, big power plants, Waste burning plants, etc. In gas mixing and blending, direct gas mass flow control provided by a mass flow controller (MFC) not volumetric flow control, is very important. Proper mixing and blending saves money and increases repeatability of the end product and improves quality. Combustion or burning applications have their own set of challenges. Combustion or burning is a chemical process, a reaction between molecules. To quantify the gas used, then, we should count those gas molecules and not the space between these gas molecules. We do that by measuring the gas mass flow, the weight of the gas (molecules), and not the volume (molecules + space between molecules). The nice thing about Mass Flow Controllers is that they do just that: They measure and/or control the gas mass flow. They are molecule counters! Mass flow controllers are devices that have an accuracy of % of full scale (%FS). That means that the uncertainty of a 1% device is 1% of the maximum flow range of the instrument. For example, if you purchase a mass flow controller with a range of 0-500 SLPM and the unit has an uncertainty 1% of full scale, the uncertainty is 1% of 500 = 5 SLPM. So, when you control a mass flow rate of 500 SLPM, the flow can be between 495 to 505 SLPM. However, if you control mass flow rate at 10 SLPM using the same 500 SLPM instrument, the uncertainty is still +/-5 SLPM. As a result, the controlled flow could be anywhere between 5 SLPM up to 15 SLPM. Pretty bad! The good news is that the newest generation of high-performance Thermal Mass Flow Controllers has drastically improved with the aid of advanced electronics, sensor, and laminar flow element design and linearization mathematics are getting closer to being % of measured value devices. And for a gas mixing and blending application requiring multiple mass flow controllers, the price of the instrument matters. You’re probably wondering what all this means for gas mixing and blending applications? The lesson learned is that the absolute accuracy is not as good when you operate the mass flow controller at the bottom of the maximum flow range of the instrument, so size your instrument correctly. 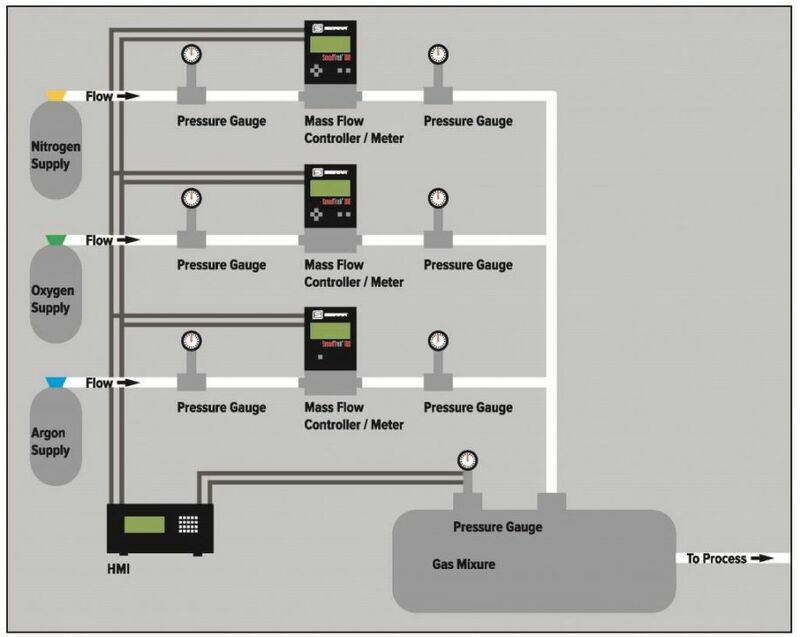 This sizing of mass flow controllers in a gas mixing system is critical. You should be very clear what the purpose and the operational range of each mass flow controller in your gas mix system should be. Ask the manufacturer of the instrument to assist you as they probably have many customers faced with the same challenge. ‘Kwik Kalucations’ with K-factors make gas mixing with a single gas mass flow meter simple. If you’re looking to improve flexibility and save money when it comes to gas mixing and blending applications, consider applying a “K-Factor.” A dimensionless numerical relation of a specific gas vs. air or nitrogen, a gas K-factor never changes. If K-factors will work in your application, you can use one gas mass flow controller calibrated on air or nitrogen for several gasses by simply applying the K-factor. K-factors, in general, do not change and are used for measurement and control of mass flow rate in units of SCCM and SLPM. For example, if you calibrate your capillary-sensor gas mass flow controller with air for 0-100 SLPM, but intend to run 100 SLPM of argon through it, you will only get an output of 69 SLPM for the instrument. That’s because the physical properties of argon that affect heat transfer (the standard gas density and specific heat) are different than air. Furthermore, when you run enough argon through the instrument so that it indicates 100 SLPM, you will actually find the flow of argon is 145 SLPM. Thus, the K-factor of Argon is always 145/100 = 1.45. Every gas has its own K-factor, but there can be slight differences across various brands of instruments. Is the K-factor a perfect linear function? Well, we assume so, but in reality that is not always true, especially with lower-cost flow sensors and flow meters for gas on the market today. Errors can be up to 7% on very specific light gasses like hydrogen or helium for these lower performing instruments. In contrast, the SmartTrak 100 digital mass flow controller is a premium instrument with a high level of reliability with K-factor behavior enabling such technologies as Dial-A-Gas, multi-gas capability. This makes the SmartTrak 100, together with the advanced digital communication possibilities of the Compod, an ideal choice in gas mixing and blending applications. Dilution is a special application in the world of gas mixing. Basically, you are diluting a concentration of gas in an already existing gas mixture. Let’s say you have a gas mixture of 10% Ar / 90% N2 and you really need 5 Ar / 95% N2 for your application. The solution is to add more N2 to the mix, but how much? To answer the question of ‘how much,’ we first need to know if the gas mix ratio is in % mass or % volume. Let’s assume it is % mass. In that case, we need to generate a new mix of 50% of the original 10% Ar / 90% N2 mix and dilute (or mix in) that with 50% N2. The result is a new mix of 5% Ar / 95% N2 mix. Most concentrations, however, are much smaller, more in the 0.0001% region. In general, one expresses this in ppm values (ppm = parts per million). This means that 10000 ppm = 1%. Wouldn’t it be nice to have an automated gas mix system that calculates this all for you? Sierra can provide this for you, contact us to learn more about our SmartTrak® 100 Digital Mass Flow Controllers for Gas Mixing & Blending. As most facilities managers can attest to, the electricity used to produce compressed air can be one of the most expensive energy costs in your facility. More about Sierra Instruments, Inc.